Her right hand resting on the heavy brass handle, Ingrid Bassen shook her head and sighed. 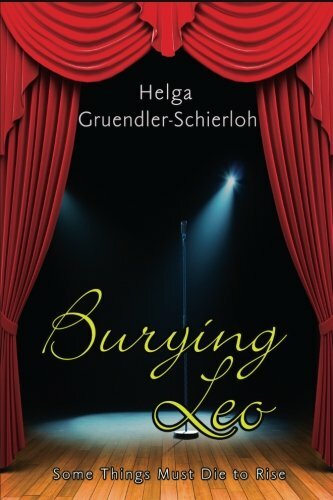 -- Burying Leo by Helga Gruendler-Schierloh. After a sexual assault, Ingrid flees Germany, hoping to bury the trauma of her past and start a new life in America. You can feel the heaviness in the opening lines. But I agree with Laurel-Rain, it sounds good. Thanks for hosting. I wonder whether the 'Leo' in question, is her husband or her attacker. Similarly, is the opening line, before or after Ingrid's assault. It sounds as though Ingrid has a very heavy heart as she either enters or leaves the room. Intriguing 'First Lines' which set a mood, yet give nothing away. I love the cover. It sounds great! Happy reading! Great opening promising a lot. A wonderful cover as well. This sounds like it could be an emotional read. The intro grabs you right in. That cover looks so cool and from that line I'd like to know more. I sense a good story after reading the first line. Intriguing. Who's Leo? Why the sigh? This week I have Murder, She Reported by Peg Cochran - a nice historical mystery. Happy reading! I love your book choices! This one is especially interesting. The cover and title alone make me curious. Sounds like an emotional story. I hope you are enjoying it. Running from the past, does it ever work? I like the plot of this one. I'm concentrating on the past and memories but not running. Acceptance.